In the middle of all that, I managed to write a couple of guest posts (I do have a problem saying “No” to some people!). We managed to have visitors and enjoy some happy moments. 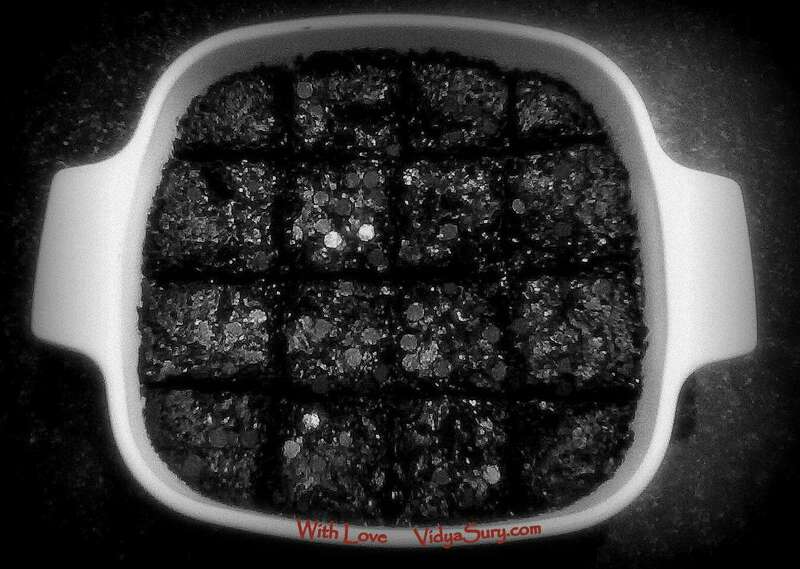 My time spent in the kitchen was totally therapeutic and that always amuses me! I used to scold my Mom back in the day when she would keep saying that…and now I am discovering I am no different. There’s something gratifying about going through the process of cooking from scratch. And satisfying. I am becoming rather an expert at this (Unknown Mami – this one’s’ for you). I can whip it up on demand. Yes, we can have our cake and eat it, too! The one thing I learned during this week past is this: nothing is impossible. Well, almost. And ultimately, it is all in our hands to be happy, or not. Each time I felt overwhelm trying to take over, I got out of the house to tackle a chore I had on my list. Makes a bit difference you know. The brisk walking, the joy of meeting other people, and the satisfaction of being able to check off an item from the (too much) to-do list. One of my favorite visits was my trip to the Seva Sadan, my local welfare home for girls, where I try and do my bit to help them with their food expenses, groceries and medical fund. I went there to arrange meals for specific days for each month of 2013 from Jan to December. Tomorrow, I am visiting them again with clothes and some groceries. A couple of months ago, I happened to shop at a popular supermarket near our place for something specific and ended up being rewarded with a bunch of coupons, entitling me to receive two kilograms of sugar for every bill of a specific value on Wednesdays. the date is stamped on these and can only be redeemed on that day. Ah, what conditions! But after getting over the complex rules, I decided to plan my monthly shopping and made lists so I could go there every Wednesday until Feb, until when the coupons are valid. So I come off every Wednesday with four kilograms of sugar and I am collecting these so I can give them to the welfare home. Don’t have to be rich to help. Most times, we only need the “intent” to do something, to motivate us into taking action. Every little helps, thank God! And special thanks to Vanita Cyril of After Bedtime Blog, without whose encouragement I may not have gotten through my week as smoothly as I did! I have realized that….Life will go on, regardless of what we do, or how we feel. So let go. I know the Universe has an order, a plan. I won’t fight it. It all works out for the best. So let go! Life is a privilege – Enjoy it! P.S. : Did you get a chance to check out 30 Days To Bold? This course is time sensitive. The price will increase on February 1st, 2013. If you register by January 14th, you will also receive for FREE , Tess’s “Take Your Fear and Shove It” course. I personally endorse it. If you think this course is for you, please join before January 14th! And now, let’s be off to Unknown Mami’s place and travel the world from there! Have a beautiful week ahead! And to quote my friend David Stevens says, Be Good To Yourselves! What a beautiful piece, Vidya! Those times of too much on the plate are a challenge for me too. I love your wonderful perspective though and the way you have used the challenge to learn to let go a little bit more. I also appreciate your model of getting out of the house and tackling a chore, which brings a sense of relief in itself. Thanks for your generosity and kindness to those at the welfare house. This is such a great example that you don’t have to be rich to help. Sandra, Right now I am reveling in the “no work, no deadlines” phase to catch up on offline stuff. What a relief, yes. I am chasing the happiness by continuing to clear up what I don’t use. Whoever phrased “Joy of giving” certainly knew what they were talking about! 🙂 I have still not gotten started on “that” cupboard though, where the journals are sitting. 😀 But am looking forward to it. I am clearing space in my mind first! Hugs! I love your idea of letting go. I can get going in too many directions, and need to rein myself in on occasion. Love this line – “I invite you to…. fill your heart with love and joy…and the world will look much brighter.” Letting go can make all the difference. Dear Cathy, sometimes life just brings on too much and I want to do everything! It is lovely up to a point,but sometimes the mind is willing and the body is not …and signals us to slow down. That’s the time to re-prioritize and regroup the energy 😀 Yes, letting go makes a big difference. My favorite way is to just pick up my house keys and phones and walk out of the house! Hugs! Dear Tess! I enjoy everything I do. And I love a simple life, really. Sweeping is such a symbolic thing. Right now, I am in the middle of literally sweeping my house! 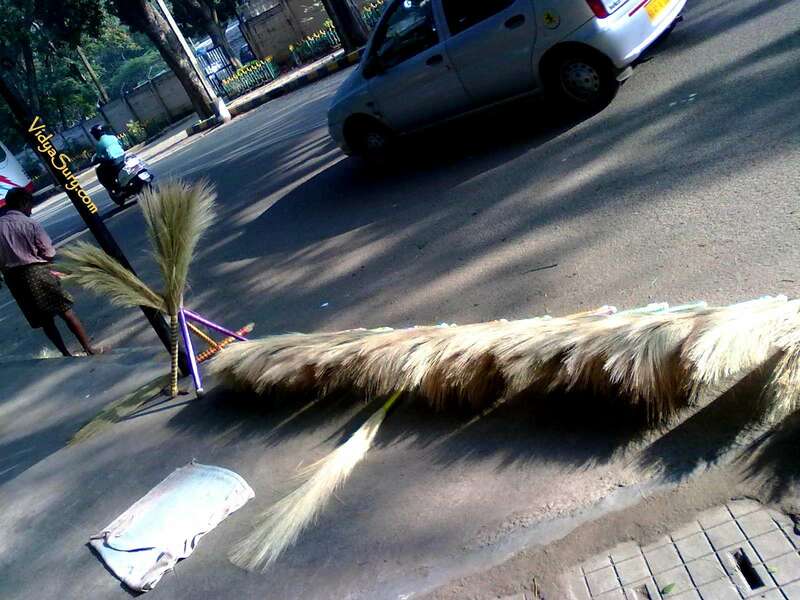 Ah…a day with brooms it seems Vidya! broomsticks. In fact, we had different types for inside the house, outside the house and the porch portion 😀 Ah, I never haggle over the price of these things – doesn’t seem fair! 🙂 How is 2013 going for you? I hear ya; back in November when I decided I needed to take a break and just walk away for awhile I was a little anxious at first. However, and like you said, life goes on and there wasn’t a tremendous groundswell to bring me back so I knew I would be ok. I did miss it and I could certainly still see everybody, but I’m in a good place right now and comfortable with seeing what my new direction will look like. It is the truth, Bill. Always something else rushes in to fill the void 🙂 And usually in a good way. That’s the beauty of life. I experience that time and again! Hugs! Always great to see you! And am glad things are cool for you! Interesting…Vidya! There are so many lessons around us… if we care to look. Good to have you over again, Sulagna! (I used to have a class mate with that pretty name) 🙂 Yes, you are right, so many lessons around us. Our state of mind decides whether we want to learn! you little sneak and your surprises. i’m blessed to have you sis and am happy to be there and help however i can. thank you for the sweet shout out. hahaha. Hugs, Vanita. You mean a lot to me! We do hold on to much at times. That is like at Christmas time, I always say to myself, I am not getting everything done that needs to be done, but Christmas is going to be here anyway, so guess i shall just enjoy it. We do have to let go at times. It is like floating down a river, if we decide to try and swim aganist the flow of the water we are going to wear ourselves out and still not get anywhere. Sometimes it is better to go with the flow. “Going with the flow” – is often a very enjoyable experience Debbie! Right now i am happily caught up with major reorganizing and cleaning around the home with an intent to be lighter. I am taking the “be more with less” very very seriously. 😀 I’ve set myself a deadline – Jan 31. It really is very relaxing, even though I am busy, probably because i see instant results. Yesterday I spent a few hours cleaning our home. It’s been neglected a bit since the holidays and I woke up with the urge! So I cleaned and filled two boxes with things to give away; I made space and let go of quite a bit. By the end I was exhausted but energized in spirit, a lovely feeling. 🙂 Thank you, Sandi! I am still going through the purging…the urge is still very strong! What a sense of satisfaction to give something away! Hugs! I absolutely loved your circleofcohorts site! P.S. 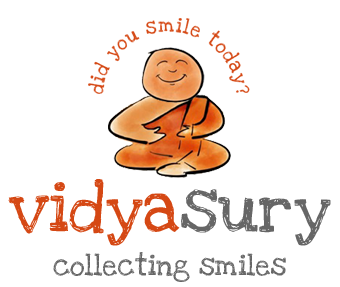 And YES I have smiled today…as soon as I saw your blog post! Hugs, Terri..you said exactly the right thing. Sometimes even a compassionate hug and smile and a listening ear are all it takes. I am glad I have stuff that the folks around me need and appreciate. 🙂 I get such a giggle out of that brainwave of mine “Did you smile today”. Seems so mean to ask my guests to “confirm you are not a spammer” 😀 Love you! And so happy you are my friend, too! what is in you cake? Chocolate? Yes, Kim. Chocolate 😀 I told my fellas I could make the plain version and dress it up but they were shocked that I would make anything but a chocolate cake. Gotta agree 😀 I love you more than all the flowers in the market during festival time! Hugs! What a little heart lightener you are Vidya. You have the best attitude in the world and I recognize the feeling of wanting to do everything at once. 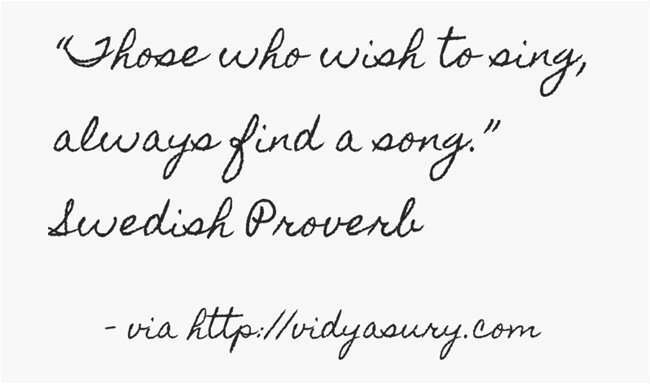 Your pics are delightful as always and I love the Swedish proverb, so I’m off to sing my song. Elle recently posted…Things That Will Kill Your Dreams. Hugs, Elle! What a sweet thing to say! I’d love to hear you sing! 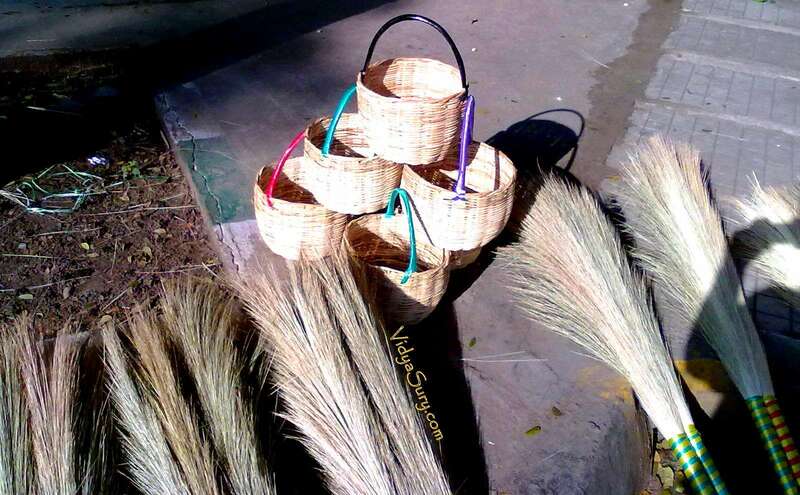 I love your photos, especially the brooms. Of course, I am pleased that you are continuing to help with the children’s home. Don’t lose heart. Giving makes such a difference, in others and our lives, too. Thanks Laurie! 🙂 The welfare homes are my favorite feel-good places! I wish to sing and I am going to find my song and if that is done, I will find another! Don’t you love that quote, Jodi! Hugs! Very nice post Vidya. The cake looks… stunning. A black color one, how did you get that color, I wonder. 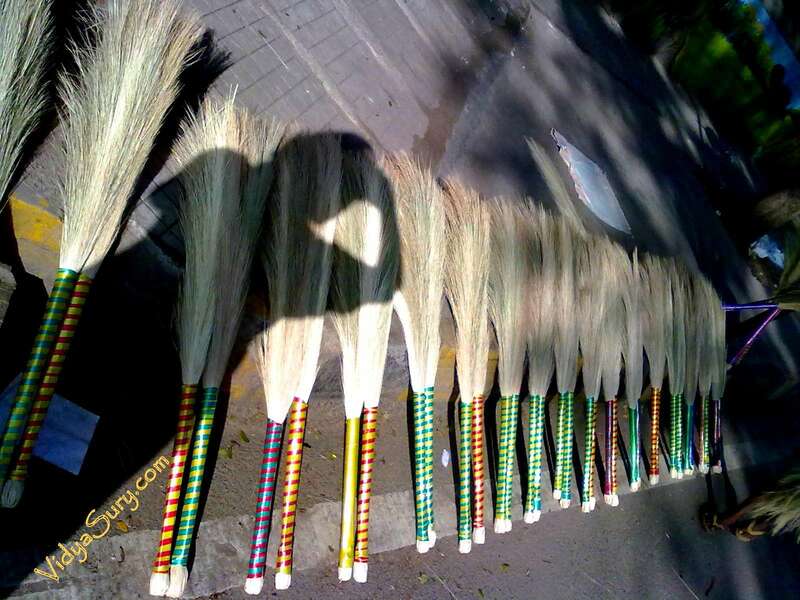 The artistic display of the brooms look very pretty. I like the brooms too. Thanks for the lovely post. Hi Pattu! Happy 2013! Cake is darkish brown. No idea why it looks SO dark though – must be the mobile camera photo. The digicam batteries had to replaced, so I clicked one with the phone. 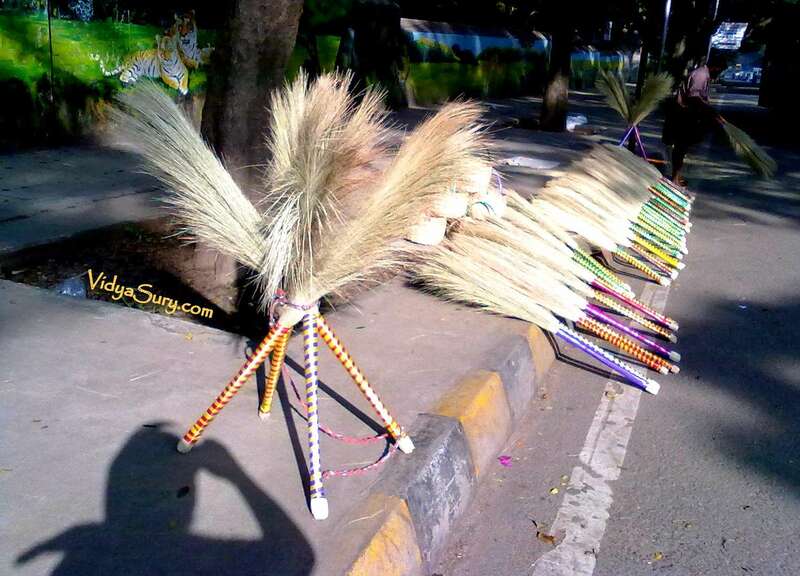 I really enjoy seeing those roadside vendors weaving the brooms and arranging them so nicely to sell them. In fact the brooms are very good! 🙂 Thanks! Noting it for may next visit. Here we are not getting quality stuff at all. Malleshwaram. 🙂 But many kirana stores stock it. 🙂 I also live here and look forward to meeting you! Sure Vidya, Never been much to Malleshwaram. Would love to stroll along with you! :-). God willing on the next visit. Julie | A Clear Sign recently posted…Is Changing Your Mind What Changes Your Life? Wow! My name in print in your blog AGAIN!?! I have arrived. I ALWAYS love finding all your comments and e-mails WHENEVER they come. When you get behind, all at once I get BLESSED with tons of “stuff” from you!!! By the way, in answer to your non word veri veri, I smile EVERY day! Hugs, Keetha! But hey, you know you are among my favorites! 😀 I am still packing my bag though! I’ll be by shortly. Ha ha ha..I stressed over replacing the “confirm you are not a spammer” – seems like such a rude thing to say to a guest! 😀 So I replaced it. Hugs! A sweet post and so profound too. Did I hear about you not able to say no to Guest Posts? That gives me a germ of an idea :-P. Looking forward to catching up with you on Sunday. And loved all those brooms and quotes. It really emphasizes your point of letting go. Beautiful shots, Vidya! 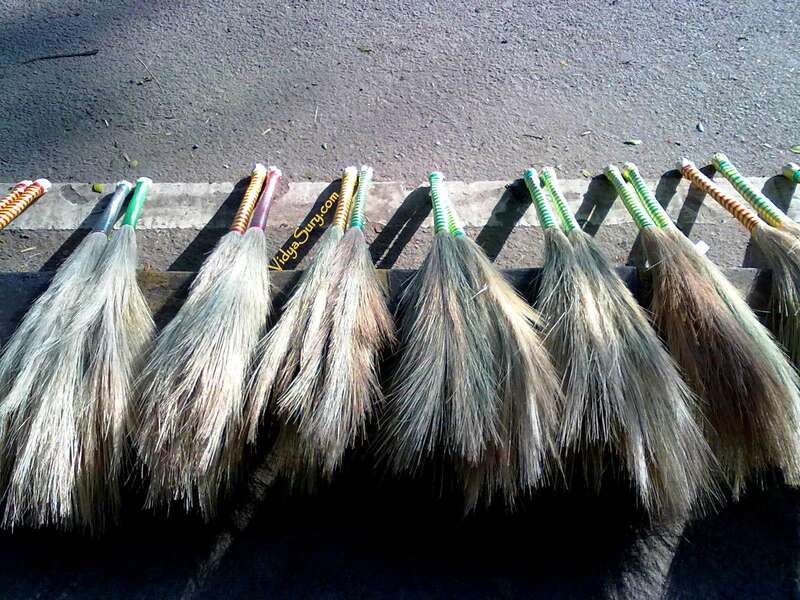 These brooms probably work really well besides being so beautiful!! And I love your quotes! Do you have them on Facebook? I’ll have to share today. Um..I’ve only just discovered a way to quickly make quote posters and share them on Pinterest and Facebook 😀 Hugs! Hi Vidya, my dear friend! A feather duster – I need a bulldozer! But your post is like a feather duster, ever so soft but doing a mighty lot! And there is so much loveliness in your post: “you do not have to be rich to help” and ”if you let go a little, you will have a little peace. 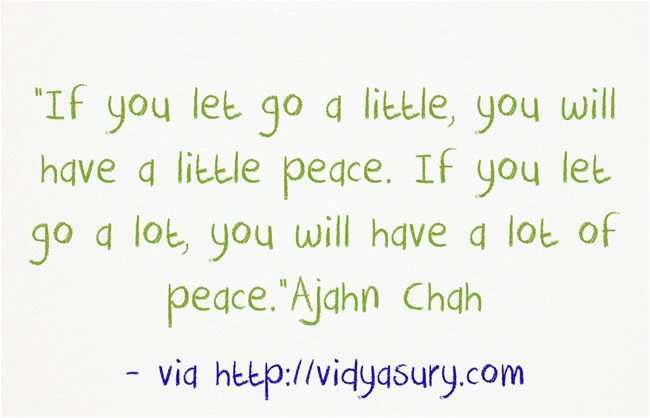 If you let go a lot, you will have a lot of peace….” tongue in cheek! Thanks so much for making my day feather light! Barbara recently posted…YOUR TURN! Lori’s Winter Tabbouleh! I am lucky that I have people to share my stuff with. Sometimes, even a large plastic bag is a boon for someone who lives on the street as they can gather their meager belongings in it. I feel like crying when they ask if they can keep the bag in which I take them things. AH…feather light is a great way to describe the feeling that follows! I am half way through an email to you. 😀 Hugs! Been here after a long time, Vidya. 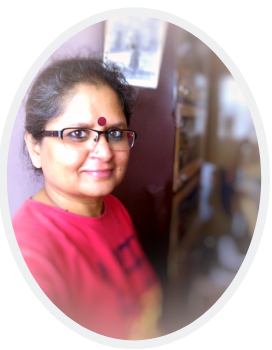 Your posts have been piling up in my box to read..:( I am going through the implementation of the let go phase this week…hope I succeed..but it’s so hard sometimes when it comes to matters that affect future..
Dear Latha! I hear you. It happens sometimes. I am guilty of packing things into an “Action” Folder in my mailbox and rather than get to it all at once, I set myself a 5 at a time goal. Much easier to nibble and watch the pile dwindle. Don’t stress over it. Tell you what – delete all the posts :D. When you have the time, just come over and spend some time here. New posts will arrive in your mailbox anyway! Re matters that affect future, I get what you are saying. Maybe for those, it is a good time to “let go” of any negative feelings and fill your mind with visions of a positive outcome? 🙂 Hugs! That cake looks decadent and dangerous in a good way. Let go my friend! 🙂 Am afraid that cake is here to stay, Claudya. Resurrecting over and over 😀 That’s what comes of something that is too easy to make, turns out perfect and disappears quickly!